Spring has finally sprung, time to get out there and enjoy it. Spring-cleaning doesn't have to be a chore, with OXO products, you can quickly get your house cleaned and have time to enjoy the new season. Enter to win over $200 worth of our spring cleaning and organizing essentials. Sweepstakes ends April 30s, 2019. 1. NO PURCHASE OR PAYMENT NECESSARY TO ENTER OR TO WIN. A PURCHASE WILL NOT INCREASE YOUR CHANCES OF WINNING. VOID WHERE PROHIBITED BY LAW AND SUBJECT TO ALL FEDERAL, STATE AND LOCAL LAWS AND REGULATIONS. 2. SPONSOR: The sponsor of the Giveaway is OXO International, Ltd (“Sponsor“), 601 West 26th Street, Suite 910, New York, NY 10001. This promotion is in no way sponsored, endorsed, administered by, or associated with, Facebook, Instagram, Google+ or Twitter (the “Social Media Channels”). You understand that you are providing your information to Sponsor. The information you provide will only be used for the purpose of communications from Sponsor. Any questions, comments or complaints regarding the promotion should be directed to OXO, not any Social Media Channels. 3. GIVEAWAY PERIOD: The Giveaway begins at 12:00 am EST on April 1, 2019 and ends at 11:59 pm EST on April 30, 2019 (“End Date”). Sponsor’s computer is the official time keeping device for this Promotion. 4. ELIGIBILITY: The Giveaway is open only to residents of the 50 United States of America or the District of Columbia who are 18 years of age or older as of their time of entry. Employees and agents, including their family (parents, children, siblings, spouse) and members of their household (whether or not related), of Sponsor and each of its subsidiaries, affiliates, parent companies, distributors, divisions, agencies or of any related entity, including any consultants to Sponsor, are not eligible to participate in the Giveaway. 5. 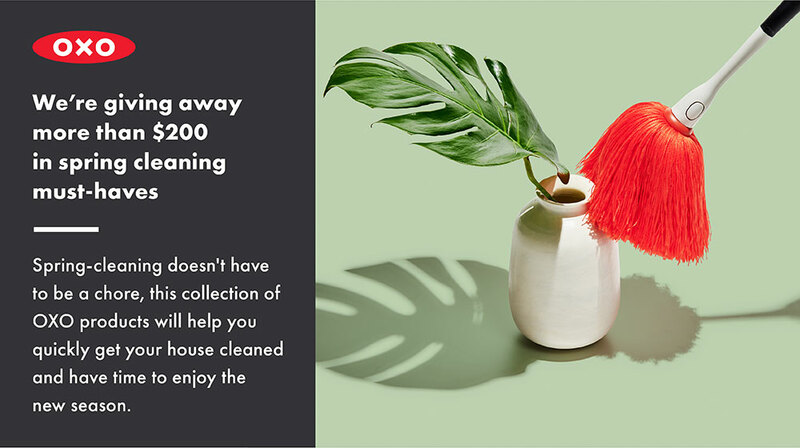 PRIZES: The Ultimate OXO Spring Cleaning Bundle. Prize includes OXO Good Grips Spray Mop with Slide Out Scrubber ($34.99), OXO Good Grips Microfiber Dust Mop with Fringe ($24.99) OXO Good Grips Extendable Tub and Tile Scrubber ($12.99) OXO Good Grips Microfiber Delicate Duster OXO Good Grips 10-Piece Pop Container Set ($99.99) OXO Steel Soap Dispensing Dish Brush OXO Good Grips Stainless Steel Sinkware Organizer ($19.99)and OXO Good Grips Drawer Dividers ($19.99). This suite of OXO cleaning productsis valued at $233.92. Prizes are non-transferable and no cash equivalent or substitution of prize is offered, except at the sole discretion of the Sponsor. If a prize, or any portion thereof, cannot be awarded for any reason, Sponsor reserves the right to substitute prize with another prize of equal or greater value. Prize winner will be solely responsible for all federal, state and/or local taxes, and for any other fees or costs associated with the prize he/she receives, regardless of whether prize, in whole or in part, is used. Prizes will be sent by OXO International, Ltd. and shipping will be paid for by OXO International, Ltd. Prizes may take up to sixty (60) days to arrive, after Winner’s address is provided. Sponsor is not responsible for any prizes not delivered or lost during transit. 7. HOW TO ENTER: There are two (2) ways to enter the Giveaway: (1) Enter email address on sweepstakes entry page on OXO website (2) send an email with your full name and email address to [email protected] with a subject line of ”OXO Giveaway”. All entries must be received by the End Date. Limit one entry per household. All entry information and materials become the property of Sponsor and will not be acknowledged or returned. 8. WINNER SELECTION: The winners will be determined by a computerized random selection conducted by Sponsor from all eligible entries. All results of the selections are final and binding, subject to these Official Rules. In the event a winning entry is discovered to be invalid for any reason whatsoever or the person who submitted the winning entry fails to comply with these Official Rules prior to delivery of the prize, the prize may be forfeited and awarded to an alternate Winner. If by reason of a printing, computer or other error, more prizes are claimed than the number set forth in these Official Rules, all persons making purportedly valid claims will be included in a computerized random selection to award the advertised number of prizes available. No more than the advertised number of prizes will be awarded. 9. NOTICE TO WINNER: Attempts to notify the potential Winner will be made by email within seven (7) days of the computerized random selection. Winners must provide their shipping addresses to Sponsor via direct message on Facebook in order to receive their prize. Sponsor is not responsible for lost, stolen, late or misdirected mail or delivery or communication problems of any kind. If unable to make contact with the Winner within seven (7) days after Sponsor first attempts to notify the Winner, or if the Winner fails to claim the Prize within seven (7) days after Sponsor first attempts to notify the Prize Winner, the Prize maybe forfeited and awarded to an alternate Winner. All federal, state and local taxes and fees, as well as any other expenses not specified herein, are the sole responsibility of the winner. 10. WINNER LIST: For the name of the winner, send a stamped, self-addressed envelope to OXO International, Ltd., 601 West 26th Street, Suite 910, New York, NY 10001. All requests must be received by December 31, 2018. Winner lists will be sent once winner has been verified. 11. Sponsor is not responsible for telecommunications, network, electronic, technical or computer failures of any kind, including any which may affect your entry or the Giveaway. Sponsor is not responsible for lost, stolen, misdirected, mutilated, late or illegible entries. Entries not in compliance with these Official Rules are disqualified. Sponsor shall have the absolute right to determine if an entry is in compliance with these official rules without notice to the person attempting to enter. 12. By entering the Giveaway, each participant warrants that he or she has read and agrees to abide by these Official Rules and that he or she is not prohibited from participating in the Giveaway. Each participant agrees to release, discharge, indemnify and hold harmless Sponsor and its parents, subsidiaries, affiliates, shareholders, employees, officers, directors, agents, representatives, advertising and promotion agencies and prize suppliers from any injury, loss or damage to person, including death or property due in-whole or in-part, directly or indirectly to the acceptance or use/misuse of the prize, expiration of validity of the prize, participation in any Giveaway related activity, or participation in the Giveaway. As a condition of entering, entrants agree (and agree to confirm in writing): (a) to release Sponsor, from any and all liability, loss or damage incurred with respect to the awarding, receipt, possession, and/or use or misuse of the prize or any item redeemed therewith, (b) under no circumstances will entrant be permitted to obtain awards for, and entrant hereby waives all rights to claim, punitive, incidental, consequential, or any other damages, other than for actual out-of-pocket expenses; (c) all causes of action arising out of or connected with this Sweepstakes, or the prize, shall be resolved individually, without resort to any form of class action; and (d) any and all claims, judgments, and award shall be limited to actual out-of-pocket costs incurred, excluding attorneys’ fees and court costs. SOME JURISDICTIONS DO NOT ALLOW THE LIMITATIONS OR EXCLUSION OF LIABILITY FOR INCIDENTAL OR CONSEQUENTIAL DAMAGES, SO THE ABOVE MAY NOT APPLY TO YOU. 14. Sponsor reserves the right to suspend or cancel the Giveaway or modify these Official Rules as necessary for any reason or as required by applicable law. Sponsor reserves the right, at its sole discretion, to disqualify from the Giveaway, and ban from any future promotions, any person it believes to have intentionally violated these Official Rules or tampered with any element of the Giveaway without notice to the disqualified or banned person. Any attempt by an entrant to deliberately damage any web site or undermine the legitimate operation of the giveaway is a violation of criminal and civil laws. Should such an attempt be made, Sponsor reserves the right to seek damages from any such individual to the fullest extent permitted by law. 15. DISPUTES: Except where prohibited, entrant agrees that: (1) these Official Rules or the rights and obligations of the entrant and Sponsor in connection with this Contest shall be governed and construed by the laws of the State of New York, without regard to its conflict of laws; and (2) any and all disputes, claims and causes of action arising out of or connected with this Contest or any prize awarded shall be resolved individually, without resort to any form of class action. We're always on the lookout for talented people to join our team — we're sure to have the right fit, whatever your expertise. Our products are available nationwide. Use our store locator to find a store closest to you.